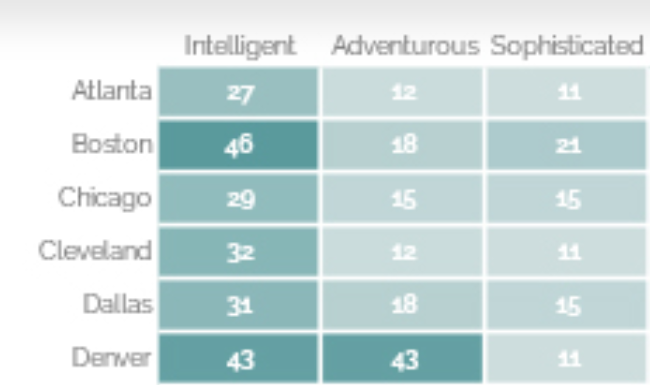 Denver residents use terms like "intelligent" and "adventurous" to describe local attitudes. What adjectives would you use to describe fellow Denverites? According to a survey conducted by You Gov Omnibus, the most common terms chosen to describe Denver residents were "intelligent," "adventurous," "charitable," and "eco-conscious." Respondents were less likely to choose negative terms such as "lazy," "shallow," and "rude," and only 11 percent believed Denverites are "sophisticated." Of the 20 cities included in the study, Denver was most associated with the term "adventurous." In fact, 43 percent of respondents chose this adjective to describe fellow Denverites. Seattle and Portland came next, with less than 30 percent of respondents indicating the term. And 43 percent of survey participants described Denver residents as "intelligent," putting Denver close behind Boston and Washington, D.C., the cities with the highest percentage of respondents choosing this term. Respondents in all cities favored positive terms, but not all responses were as glowing as those from Denver residents. About one in four Miami residents used the terms "selfish" and "shallow" to describe fellow residents' attitudes, while 25 percent of Phoenix residents said the city tended to be "close-minded." And a quarter of New Yorkers and Philadelphians admitted that fellow residents could be described as "rude." These perspectives aren't necessarily backed up by the facts, however. Though 46 percent of respondents called Denverites "eco-conscious," a report showed that Denver's recycling rate is one of the worst in the nation. But Denver did rank number 14 in the country's smartest cities, according to a report from Wallet Hub, so perhaps we are correct to describe Denver as an "intelligent" city. While measuring the extent to which Denver residents are "adventurous" might be more difficult, it certainly makes sense that locals would want to explore. Not only is Denver a vibrant city, but it also gives its residents easy access to the beauty of the natural world. What adjectives would you use to describe Denver residents? Let us know in the comments below! Here's what's coming and going from Netflix in January!